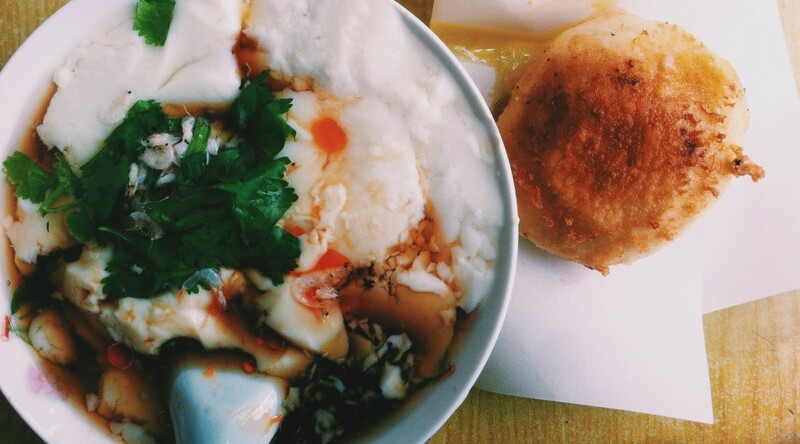 Dòu Huā (Chinese: 豆花) is a street food commonly eaten as breakfast or a late night treat alongside a crispy youtiao. In Shanghai, it is usually served with savory flavors and garnishes such as soy sauce, salt, cilantro, chili oil, pickled mustard tuber, and sliced pieces of youtiao. The tofu curd is made from dried soybeans, water, gypsum powder and cornflour. The dessert version adds a dark syrup infused with ginger. The salty version adds a dash of soy sauce, chili oil, and salt and garnishes with cilantro and minced pieces of pickled mustard tuber. The soy milk is first made by soaking pulverized soybeans with water and straining it, repeating this process multiple times. Once the soy milk is made, it is left to simmer as a mixture of gypsum powder, corn flour and water are slowly added in. After the curd has set, it can be spooned into a bowl and topped with whatever sweet or salty dressings desired. According to legends, tofu originated in China over 2,000 years ago. It is believed that its production began during the Han Dynasty when a cook decided to experiment by flavoring a batch of cooked soybeans with the compound nagari. Instead of getting flavored soybeans, he ended up with bean curd.